Can Resolving Cyprus Hold the Key to Regional Energy Cooperation? The 127 bcm of natural gas found in the Block 12 Aphrodite field in the Cypriot Exclusive Economic Zone (EEZ) in 2011, coupled with the much more significant findings in neighboring Israel’s Leviathan and Tamar fields, and more recently in Egypt’s Zohr, generated overexcitement and disproportionate optimism regarding the economic future of the island and the prospects for a settlement of the Cyprus problem. There is a two-fold economic-based assumption that attempts to justify this optimism, namely that a settlement could enhance the hydrocarbon exploitation options for Cyprus and secondly that the revenue from the exploitation could be utilized to cover some of the settlement costs. We argue that this optimism is largely unjustified. The fact that almost all Eastern Mediterranean states have discovered varying quantities of natural gas resources in their EEZs created optimism that energy-based regional collaboration and stability will ensue as a result. The premise is that the exploitation prospects of the Eastern Mediterranean gas could alter the regional geopolitical relations and reshape interests in a way that would bridge the gap in the presently irreconcilable positions and facilitate inter-state cooperation and peace. Our focus in this article is on the regional triangle of Turkey, Israel, and Cyprus since all three states are key players in regional developments, albeit for different reasons as will be illustrated below. With its growing need for natural gas, Turkey is an attractive market and seems to be a natural destination for Israeli and Cypriot gas. With its growing need for natural gas, Turkey is an attractive market and seems to be a natural destination for Israeli and Cypriot gas. However, the Turkish-Israeli-Cypriot triangle is particularly complex, with bilateral securitization relations ranging from completely desecuritized (Israel-Republic of Cyprus (RoC)) to securitized albeit with a desecuritizing tendency (Turkey – Israel) to deeply securitized (Turkey-RoC). These relations have inevitably become intertwined due to the energy factor. 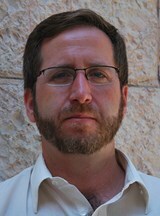 Conversely, they could even be perceived as mutually exclusive, with Israel being the key state that influences securitization levels within the triangle; closer Israeli relations with either of the two other states is usually perceived in zero-sum terms and subsequently as a negative development by the third state. 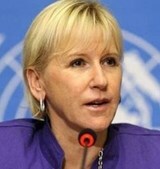 Cyprus, on the other hand, remains a key actor because of its geographical position and the unresolved division, which complicates not only Cypriot but also regional hydrocarbon exploitation options. We will approach the issue from two diametrically opposed perspectives. The first question is whether Eastern Mediterranean energy considerations could lead to regional collaboration and a negotiated settlement. The second is the reverse; we explore whether a resolution of the Cyprus problem would allow energy collaboration to alter regional political relations. Can the Discovery of Hydrocarbons Lead to Regional Stability and a Settlement of the Cyprus Problem? There is no strong support of the so-called “peace pipelines” argument as there is no concrete evidence that energy relations could alleviate the problem. On the contrary, stable and cooperative political behavior is generally regarded as a prerequisite for the development of any energy-related investment. As we have argued elsewhere, energy as a referent object of security has a multiplier effect on states’ political securitization relations. Specifically, in cases where states have deeply securitized political relations, energy is more likely to augment their security concerns and to heighten tensions in securitized environments. The reverse tends to occur as well – desecuritized political relations not only allow for collaboration, but also increase the likelihood that energy-related developments will enhance their desecuritized status. The impact of energy on de/securitization relations is due to the fact that hydrocarbons and oil are very rarely treated solely as economic commodities. More often than not, they are also used as political tools to enhance foreign policy influence and empower the political position of states vis-à-vis adversaries either by forming dependency relations or through alliance formation. The importance of stability in the Eastern Mediterranean is unquestionable, especially given the extremely volatile environment in the Middle East and North Africa. This is the case for regional actors – such as Turkey, Israel, Egypt and Cyprus – who would welcome the energy-induced incentives for stability, as well as for external actors and more specifically the US, which has been uneasy over the deteriorating relations between its two biggest regional allies, namely Turkey and Israel. Indeed, the prospect for energy collaboration between Israel and Turkey seems to be one of the strong incentives for the two states to start desecuritizing – and even normalize – their relations. However, the complexities of the Eastern Mediterranean region, primarily the unresolved Cyprus problem, render this goal even more challenging. The RoC’s geopolitical role has grown with the Eastern Mediterranean hydrocarbon discovery, along with the island’s EEZ neighbors Israel and Egypt, and more importantly because it is situated between the latter two and Turkey (see Fig. 1). While Turkey challenges the Cypriot EEZ (see Fig. 4), Israel and Egypt do not. 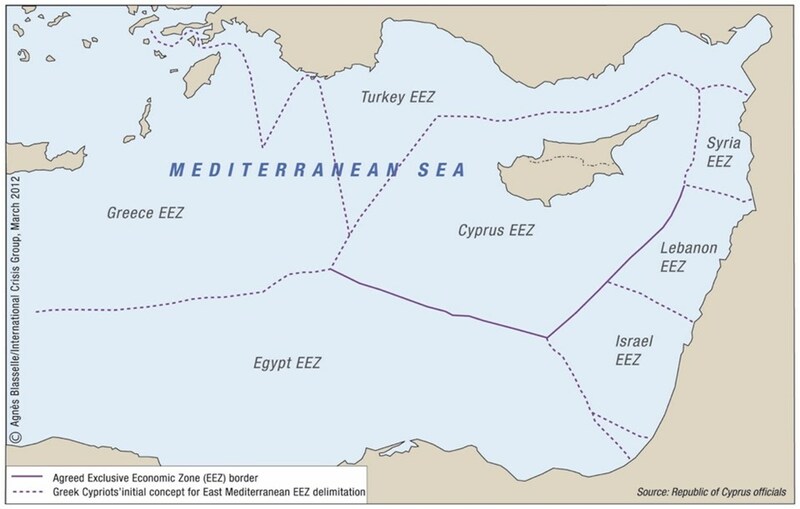 Thus, the unresolved Cyprus problem complicates any potential hydrocarbon collaboration between Israel and Turkey as any pipeline from Israel to Turkey has to pass through the RoC EEZ; alternative routes via Syrian and Lebanese EEZs are not realistic options for Israel. Stable and cooperative political behavior is generally regarded as a prerequisite for the development of any energy-related investment. It is worth noting that Cypriot-Israeli relations are not solely energy-dependent. The desecuritized relations between the two states allow Israel to use the disproportionately large Cypriot Flight Information Region (FIR) (Fig. 2) for military exercises and search and rescue missions. Figure 3 indicates the relatively small Search and Rescue Regions (SRRs) of the neighboring states compared to the Cypriot region. Potential regional energy collaboration has made a positive contribution to the development of healthy and multi-dimensional Israeli-Cypriot relations. This development was possible because the political relations between the two states were completely desecuritized prior to the discovery of hydrocarbons. Thus, the prospect of energy relations in the case of Turkey and Israel – and more importantly the impact that hydrocarbons will have on political relations of these two states – depend on the status of bilateral and potentially regional political securitization. Currently, the two neighbors seem to be using the prospect of hydrocarbon relations as an excuse to normalize their political relations, which in turn would allow for the emergence of energy-related agreements if regional developments permitted. Conversely, there are likely to be negative developments if Israel decides to proceed with exploitation options that do not involve Turkey; for example, through exports to one of the other two under-utilized Egyptian LNG terminals. Turkish-Cypriot relations provide much stronger support of the aforementioned multiplier-impact argument. The deeply securitized relations between the RoC and Turkey do not allow for much optimism for any form of hydrocarbon-related collaboration, or indeed for a hydrocarbon-induced negotiated settlement. On the contrary, further securitization is likely as Turkey will probably continue to react strongly and negatively to any attempts by the RoC to exploit its reserves, making hydrocarbons yet another area of contention and a pretext that exacerbates the incompatibility of the two sides’ positions even further. In addition, it would not be surprising if Turkey decides to further securitize the environment through escalating actions as was the case in 2014 when it issued a NAVTEX and sent the seismic frigate Barbaros into the area where the RoC was drilling for hydrocarbons. It is worth reminding our readers that this particular incident led to the interruption of negotiations between the Greek and Turkish Cypriot political elite. 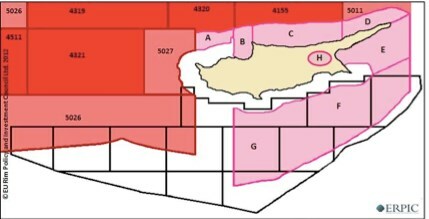 Further evidence of the potentially negative impact of hydrocarbons in the region is Turkey’s attempt to challenge the RoC’s EEZ and sovereignty by claiming specific areas as part of its own EEZ as well as that of the internationally-unrecognized “Turkish Republic of Northern Cyprus” (TRNC) EEZs (see Fig. 4). 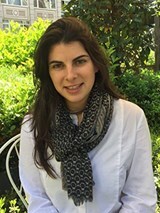 Even if hydrocarbons do not lead to further securitization or escalation, it is rather unreasonable to expect that the presence of natural gas will contribute towards a mutually accepted agreement unlinked to energy issues of the Cyprus problem, such as governance and territorial adjustments. Similarly, the argument that revenues from natural gas could offset the cost of settlement is problematic for both financial and political reasons. Can a Resolution of the Cyprus Problem Pave the Way for Energy Collaboration to Alter Regional Political Relations? A negotiated settlement on the island could present a number of opportunities for further regional transformation. A potential benefit that is specific to the Republic of Cyprus is that the option of exporting energy either through or simply to Turkey becomes available. However, whether or not this is a desirable option politically remains questionable; after decades of distrust, it seems unlikely – or even unwise – for Cyprus to put all its eggs in one basket and commit to the Turkish option if that option ultimately submits it to a condition of monopsony. A more realistic scenario is for export to Turkey to be an additional outlet in a diversified export portfolio. In this way, a negotiated settlement could promote Cyprus’ long-stated goal of becoming an energy hub. 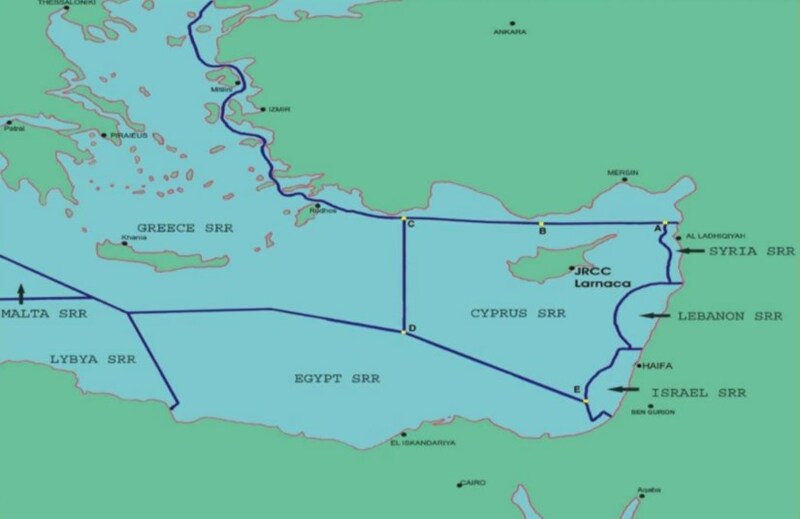 It must be, however, noted that such a goal is likely to be restricted to energy service provision rather than outright supply due to the relatively small scale of operations that are likely to result either from the already confirmed or expected quantities of natural gas in the Cypriot EEZ. A negotiated settlement could promote Cyprus’ long-stated goal of becoming an energy hub. A significant regional consideration is that the Cyprus problem would no longer be instrumentalized by other states post-settlement. For example, Israel would no longer be able to disregard the resulting economic and political viability of the Turkish export option, at least not by recourse to the limitations imposed on the possibilities of regional cooperation due to the specificities of the Cyprus problem. In fact, contrary to the existing prevailing conditions, Cyprus’ good political relations with most of its neighbors could then be utilized for more holistic regional collaboration. On the other hand, euphoric prognostications must be mitigated by an understanding that a Cyprus resolution cannot have a far-reaching direct effect on regional relations, such as a spill-over effect on conflict resolution in the wider region of the Middle East. Perhaps most significantly, a settlement also poses some important “day after” challenges. A unified Cyprus will potentially face challenges in maintaining and/or deepening relations with other regional actors such as Israel and Egypt. A driving force in the reconfiguration of these relationships on a bilateral level has been each reciprocal state’s own issues in their foreign relations with Turkey. Depending on the structure of a negotiated settlement, the extent of Turkey’s influence – institutionalized or otherwise – in Cyprus’ foreign affairs is likely to alter both the negotiating calculus and the incentives from a regional perspective. Turkey will also face a significant dilemma in its relations with a unified Cyprus in terms of EEZ delimitation. Turkey is not a signatory of UNCLOS III and does not formally recognize the Republic of Cyprus. In the case of a solution Turkey may still maintain its status as a non-signatory of UNCLOS III, but it will be particularly difficult, if not impossible, not to recognize the Republic of Cyprus. Turkey – due to its existing maritime dispute with Greece, the hydrocarbon discoveries in the region, as well as the inter-relationship between the two – does not accede to any judicial settlement of international disputes. Turkey maintains its traditional position regarding the maritime delimitation of the Aegean Sea, which is that islands in special circumstances should not be afforded the right to an extension of territorial waters to an EEZ. In light of these developments Turkey has applied this position to the Eastern Mediterranean, most notably in relation to its own potential EEZ demarcation vis-à-vis Greece and Cyprus. 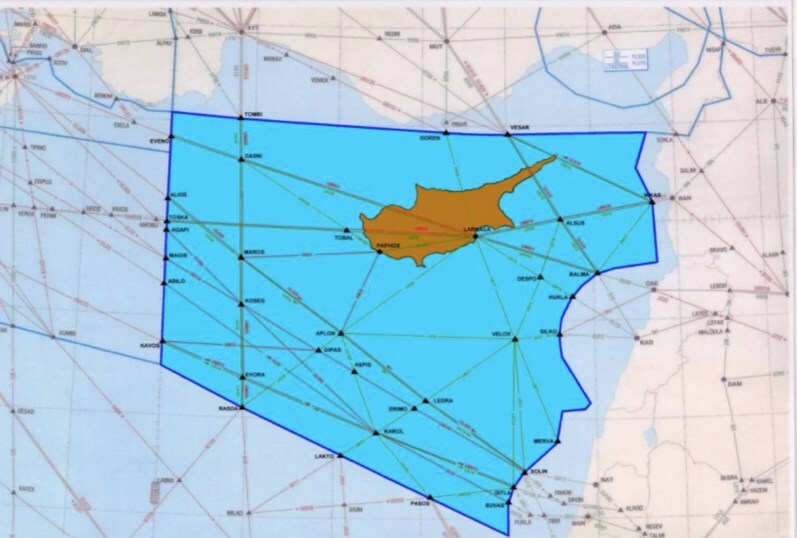 The de facto division of Cyprus complicates the issue even further, as the delimitation of its EEZ to the North cannot follow the same unproblematic path as it did to the South with Egypt, Israel, and Lebanon. The Turkish claim is that delimitation must be determined by the use of the continental shelf in accordance with the equitable principles/relevant circumstances method. The question remains whether Turkey will continue to view Cyprus as such a special case or whether it will revise its stance accordingly in case of a solution. In the latter case, its political maneuver will have to be both calculated and precise, as the legal ramifications may impact its long-standing stance on the Aegean. Either way, a resolution of the current division on the island will force Turkey’s hand when it comes to adjusting its position in this regard. The deeply securitized relations between the RoC and Turkey do not allow for much optimism for any form of hydrocarbon-related collaboration. A final consideration is whether a settlement can fundamentally alter the regional security structure. Elsewhere, we have argued that energy discoveries in the region can induce a regional transformation that effectively changes the boundaries of existing RSCs. Briefly stated, an RSC is defined as “a set of units whose major processes of securitization, desecuritization or both, are so interlinked that their security problems cannot be reasonably analyzed or resolved apart from one another.” The Eastern Mediterranean region and more specifically the Turkey-Israel-Cyprus triangle is particularly interesting, given that the prospects for the formation of energy-related alliances for production purposes alters and potentially intensifies securitization trends in the existing relations among states. Contrary to expectations, the formation of this troubled triangle formulates a sub-complex which is not firmly embedded within a larger RSC. On the contrary, it is geographically and politically situated at the edge of two RSCs with Turkey as an insulator state. Given that security relations between Turkey and Cyprus have been enduringly characterized by constancy and inflexibility with respect to an invariably heightened level of tension, Israel can be regarded as the key state in terms of variability of securitization levels that can effect changes in securitization relations within this triangle. Any improvement or deepening of relations between Israel and any one of the other two states is likely to be automatically perceived as a negative development by the third country within a framework of zero-sum characterization of tripartite relations. International Oil Companies (IOCs) have a particularly complex role to play in these relations, not least because collaboration between states and IOCs must inevitably be long-term and typically far longer than the time horizon of decision-making by political actors within their domestic frameworks. Furthermore, unlike other multinational corporations, IOCs enjoy substantially more power if they also serve state interests, allowing them to exert significant influence on the host and target countries. States in turn utilize these Multi-National Corporations (MNCs) to forge bilateral relations and alliances, thus allowing MNCs to directly or indirectly influence the security and securitization status quo within RSCs where energy either already plays a significant role or becomes an emergent variable. Subsequently, distant powerful states can, through state-influenced MNCs, acquire the capacity to intervene in RSCs that otherwise fall outside their sphere of influence. In cases where states have deeply securitized political relations, energy is more likely to augment their security concerns and to heighten tensions in securitized environments. We argue that the end of Cyprus’ long-standing division is unlikely to have a major impact in this regard. A unified Cyprus could be a facilitator that promotes energy-specific collaborations within the bargaining context analyzed above, but it is unlikely to have sufficient impact to significantly change political securitization relations. In fact, the absence of the Cyprus problem could highlight the depth of the existing securitized relations among regional actors. Similarly, it will further highlight the EEZ delimitation challenges as indicated above. The complexities of the bilateral and regional relations outlined above demonstrate how difficult it will be for hydrocarbons to become a political game changer in the region. In addition, by turning this prevailing discourse on its head, we question whether resolution of the Cyprus problem can pave the way for energy to alter regional geopolitical relations. We argue that while resolving the problem will contribute to the desecuritization of some aspects of the bilateral and multilateral environment, it is unlikely to fundamentally alter the possible impact of energy, which will not necessarily be conducive to further desecuritization. In fact, the presence of hydrocarbons may limit the desecuritization impact of the settlement and potentially even lead to further securitization and complications of bilateral relations. A recent statement by the Turkish Foreign Ministry that “Turkey would not allow foreign companies to explore for hydrocarbons” in Block 6 – which Turkey regards “to lie at the external borders of the Turkish continental shelf” – is indicative of the interplay among these complexities. It is difficult to anticipate how these complexities could be resolved even in the case of a resolution to the Cyprus problem. Constantinos Adamides and Odysseas Christou, “Beyond Hegemony: Cyprus, Energy Securitization and the Emergence of New Regional Security Complexes,” in Spyridon N. Litsas and Aristotle Tziampiris (eds. ), The Eastern Mediterranean in Transition in the Era of Multipolarity (Farnham: Ashgate Publishing, 2015), pp. 179–190. Brenda Shaffer, Energy Politics (Philadelphia, University of Pennsylvania Press, 2009), p. 67. Odysseas Christou and Constantinos Adamides, “Energy Securitization and Desecuritization in the New Middle East,” Security Dialogue, 44, 5-6 (2013), pp. 507–522. Barry Buzan, Ole Wæver, and Jaap de Wilde, Security: A New Framework for Analysis (Boulder, CO: Lynne Rienner, 1998), p. 201. Constantinos Adamides is an Assistant Professor of International Politics and Director of the Diplomatic Academy at the University of Nicosia. Odysseas Christou is an Assistant Professor of Government, International Law, and International Relations at the University of Nicosia.